Life changes. We adjust. Life changes. We adjust. Life changes......We adjust. Simplistic I know, but sometimes it's the simplest concepts that finally resonate that seem to pack the biggest "ah-ha" punches. Ella will be one in just over a week. I can hardly believe an entire year has gone by! Those who have children, especially very young ones, you know how much of a paradox the passing of time can be. The day to day seems SOOOOO slow and tedious sometimes-- it's what Scott and I like to refer to as "the grind"; the dishes, the laundry, the messy floors and diapers and hands, the baths, the toys, the bedtime routines and the sometimes sleepless nights. Then, one morning, you wake up and an entire year has gone by and you have to ask yourself where it went. But, in that year, we have learned to become parents to not one child, but two-- a change of pace that has felt monumental and overwhelming at times, but one that we seemed to have finally adjusted too. I had a moment earlier this week when I was cleaning up the kitchen and the girls were playing quietly together in the living room and we were just all in our own little grooves for a couple of minutes and I thought, "Hmm, this is our life and I'm cool with that, even happy." We have reached a point where we have all figured out how to live together and with each other. We each have a role and we have routines. I know they won't stay the same, but there is a sense of normalcy in the day to day again. Every time you bring home a new child there is some major boat rocking that happens. New schedules, new personalities, new likes and dislikes, new demands on your time and energies...and with the second a new need to balance the needs of an infant and the wants of a toddler...and in the beginning, it all seems a little chaotic and then you eventually just start to get into a groove- you get to know each other, love each other, you get frustrated with each other and move on. You develop a new normal. To quote a song, "it's this crazy little thing called love." And it's called family. And it's really cool and wonderful and I'm thankful for it all. I imagine my life is not the only one that feels messy more than it feels neat, orderly and in control. This is really pretty clean for the house, but you know what I mean. There is always, always STUFF all over the place. Random stuff. Dumbells, diapers, a toothbrush, a bracelet, pieces of toilet paper, empty bottles (baby bottles, that is...don't get the wrong idea here! ), toys, scarves, miscellaneous shoes, cups, socks without a partner...stuff. A friend of mine (Here's to you Ellen!) joked the other day that she felt like a perfectionist, but not an ordinary perfectionist, a perfectionist in her mind! You know, you want things to be perfect but are so overwhelmed by the task that you don't actually make them perfect and so you live in chaos, but frustrated about it, because you want it to be perfect. Do you ever feel that way? I do all the time. I am a type A person in my head. The type that wants my surroundings to be neat and orderly in order for me to feel peaceful. The type of person that likes plans, and to know what is coming next. I make my husband crazy planning our days minute by minute sometimes...poor guy. The thing is, especially with little kids, and because neither my husband nor I are super disciplined people, that things are not always so neat and orderly and planned...and therefore I find myself feeling frustrated by that a lot of the time. How silly is that?! Having kids has been a real lesson in patience in this area of my life. In learning to LET GO! I was reminded of this when I started painting with Ava earlier today. I looked at the table at one point and wanted to start cleaning everything up, putting everything in order, wiping her hands incessantly, but instead I stepped back and said, "Lisa, let it go. Let her paint. Let her smoosh her hands in it and get it ALL over the paper. It's part of the process." Deep breath. Ok. Let go. And so I did and it was fun. I'm trying to do that more with life. Deep breath. Ok. Let go. After all, I figure, if things are going to be messy more often than they are clean, why would I want to be crabby more often than I'm happy? Boy, sometimes I think I'm finally growing up. 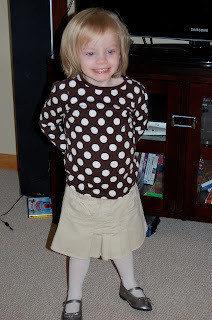 This was our little cutie before church today. I put this outfit on her and she said, "Mommy, do I look pretty? Do I look like you?" At which point she asked, "Mommy, am I a pretty princess?" So sweet. First of all I'll take it as a compliment that she's insinuating that I'm pretty because there will come a time in her life when she may be more critical of the mom who is dropping her off at school, or kissing her in front of her friends or wanting to walk around the mall with her. I like that she views me adoringly at this stage of the game, so I'll take it as long as I can. But, more importantly, I wanted to scream "OF COURSE YOU ARE PRETTY!!! DON'T EVER LET ANYONE TELL YOU OTHERWISE. YOU ARE BEAUTIFUL INSIDE IN OUT AND I HOPE YOU ALWAYS KNOW THAT AND NEVER FORGET IT!!!" Really, I was just slightly taken aback that already at 2 1/2 she has the awareness to ask if she is pretty. And, it reminded me of the task at hand as parents; instilling a sense of self-esteem in our children, from a young age, that confirms in them that they are valuable, that their traits and characteristics are wonderful, and that God created each one of his children to be beautiful. I admit, I have no idea how to do this on a tangible level. I feel SO ill-equipped for this mommy job sometimes, except that I know that I am doing the best that I can, and as my girls grow and mature I will continue to try to be knowledgeable, aware and most importantly prayerful about the things going on in their lives. I do know, from my days of teaching high-school English, that self-esteem infiltrates ALL areas of a a child's life; their behavior, their confidence, their ability to connect with others and to make choices for themselves. I want Ava and Ella to have a strong sense of self, not one placed in outer appearance, but one placed on who they are on the inside; the skills, talents and personality that they were created with. And, I realize, that that type of self-esteem comes from an understanding of oneself that goes WAY deeper than "Am I pretty?" Of course I will always remind my children that they are beautiful, but I will also try to teach them that it is the inner stuff that counts; how are you treating your sister? how do you treat others? how can we help others? how does God see you? what talents do you think he gave you that he wants you to share with others? So, while I know that I won't always know what to say or how best to tell my children that they are beautiful and wonderful, I'm comforted by the fact that we have a God, a creator, who knows them even better than I do...and also knows me as a mommy even better than I know myself, and that by His grace we'll all make it through. Scott works from home many days and his office is in our basement...at about 9:30 this morning he said, "Lis, what the heck is going on up there?" I just raised my eyebrows and shook my head. Crying baby, whining toddler, food smattered around the kitchen, explosive poopy diapers, said baby pulling things over, said toddler knocking baby over. These are the days that usually prompt me to think that it is a good idea to get out of the house. These are the same days that it usually turns out to be not such a good idea to get out of the house. Nonetheless, we took another afternoon trip to Wegmans to do our grocery shopping. I was going to go last night, but it got late and it was snowing pretty heavily so I decided to try to take the girls today. I stopped grocery shopping during the day after Ella was born, and now I remember why. Wegman's has a childcare room for kids 3-8 (I know Ava is not yet 3, that's another story all together.) When we entered the store I was holding Ava's hand and had Ella in the shopping cart, but knew I should take Ava to the bathroom because whoever the childcare worker was was not going to be able to take her. So, we parked our cart outside of the bathroom, I carried Ella in, and then proceeded to balance her on my knee while I put toilet paper down, unbuttoned Ava's jeans, helped her up on the potty, helped her wipe and then helped her get her pants back up. We didn't even wash her hands (gross!!!) because I didn't know what to do with Ella(there were no stools and the sink was higher than Ava's head)! This was the first time I took both of them into a store with Ella out of her infant carrier. She is getting way to big for it, but now I remember why I've kept her in it for so long...because I can just set it on the floor while I do things like help toddlers go to the bathroom and wash their hands. We finally get Ava into the childcare room, which she seemed ok about (a small miracle) and Ella and I began our shopping. Twenty minutes later my pager starts going off. Ava has a tendency to freak out in childcare settings sometimes, so I'm imagining her red-faced and crying screaming for me as I push the cart all the way back to the front of the store to check things out. She's fine. She just claims to have to go to the bathroom. We push the cart, now half full of groceries to the bathroom, leave it parked outside the door with my purse, jacket, and Ava's coat, go in, wait for a very small stall and, guess what? I balance Ella on my knee while I help pull Ava's pants down, put toilet paper down, and hoist her up on the toilet at which point she does in fact poop for the first time in a public restroom. We wipe, pull up pants, flush toilets, and cannot wash her hands again because my hands are holding Ella, but we do find some hand sanitizer. I put her back in childcare, manage to launch $170 worth of groceries in my cart because I can no longer think clearly about what I need and Ella has eaten my grocery list. Here is the funniest part of the entire afternoon; after the very nice lady at the checkout offers a grocery pick-up for me, which I readily accept, I get the girls both strapped back in the car, take a deep breath and proceed to drive home...Without my groceries. Yes, that's right. We drive a good 200-300 yards from the grocery story before I realize that my groceries are waiting at the pick-up door! Me: "I forgot our groceries!" Ava: "YOu forgot our groceries?!" Ava: "Oh. We better go back and get them." We finally got home almost two hours later and I managed to put the girls down for naps and laid in bed for a good 40 minutes myself...just because I felt so beat up. I guess I'll go back to night shopping for now. 1. a hubby who give great neck rubs and gives them freely. 2. the ability to buy groceries and to have a house to return to with them. 3. an hour and a half of mommy time while the girls nap to collect my thoughts. 5. Our wonderful friends Mark and Sara and their two little girls who were able to visit from Massachusetts this past weekend. Hugs to you all. We miss you already! This may be a short posting as the girls are due to wake up any minute, but it's an important one, so here goes! I've been reading through Genesis this month (it started as an attempt to read the Bible in a year, but I've taken that expectation off of myself. I'm enjoying reading at my own pace-- some days more, some days less. My intention is to read through the whole Bible, but not on a timeline) and have been encouraged by God's conversations with Abraham. While I could go on and on about the interactions that Abraham has with God in these early chapters (perhaps I will at a later time) I was most struck this morning by a verse in chapter 17. Abraham is talking to God, who promises to give him a child through his wife Sarah. As part of that conversation Abraham says to God, "If only Ishmael might live under your blessing!" (Ishmael is his child born to him through his wife's maidservent in an act of distrust that he would ever have a child through Sarah). I love the heart of Abraham here asking for a blessing for his child. I'm ashamed to even admit this, but in the 2 1/2 years that I've been a mom I don't know if I've ever formally asked God to bless my children. I've prayed for them, though not consistently...I've said bedtime prayers with Ava, though not consistently. But I don't know if I've ever just said boldly, "If only Ava and Ella might live under your blessing!" Wow. That's powerful. It feels like maybe the most important thing I could do for my children. Boy, do I ever feel like I'm just stumbling along as a mom sometimes, especially when it comes to integrating my faith and motherhood. I am thankful for new mercies and a new start every morning. Thank you God for your word and it's teaching in my life. I pray that Ava and Ella may live under your blessing. Amen. It has been a chaotic morning. If one child wasn't crying they were getting into something that they shouldn't be getting into and vice versa. Non-stop. All morning. Finally, at around 11:45 I announced that we were going out to lunch because the prospect of handling the girls at a table outside of our home seemed more appealing than messing up our kitchen and the table in our home again. So we packed up and drove to Wegmans. By this time, Scott was frustrated, I was frustrated, Ella was tired and crabby and Ava was in a momentary peaceful mood. Until we got into the car and Scott told her she couldn't have the freeze dried baby bananas and strawberries that I had brought for Ella. Ava wants to eat EVERYTHING except her meals lately. All of Ella's food, anything we're eating, anything she can find in the cupboards, anything except for her meals...it's a constant battle. I would have given her some of them, but Scott told her no and then she started screaming. Loudly. I told Scott I would have given her a couple, so he snatched them out of my hand and gave the entire bag to Ava and sarcastically said, "This is what you get for screaming." So we kept driving (the drive is less than 10 minutes) and Ava proceeds to dump the entire bag of freeze dried fruit into the cup holder of her car seat. Great. I keep my mouth shut and keep driving, because things have gotten hairy enough. Ava demands meatballs at Wegmans, which of course they don't have for some reason...so we end up giving her fried rice, fruit and crackers for lunch. Lunch was relatively peaceful until it was time to go home. Then, Ava NEEDED to use the potty. I took her and the entire process was, "I do it. I do it. I do it." Ugh. She wants to sit on the potty, get the toilet paper, flush the toilet, pull her pants up, all by herself. She is 2 and though she wants to do these things be herself, they are messy, and dirty and she really needs helps, but gets very frustrated when you try to help her. Finally we make it out of the bathroom and I leave the girls with Scott while I go to get the car because it's cold and snowy outside. While I'm getting the car Ava reminds Scott that we promised her that she could see the Lobsters after lunch. Scott realizes that we did tell her that we would go look at them and so he takes her back to see them, which is all fine and dandy until she sees cookies on the way to see the Lobsters and asks for one and is told no. Here we go again. I park the car out front and walk to the front of the store where I hear Ava SCREAMING long before I see her. I grab her, put her in the car, Scott puts Ella in the car and we pull away while Ava is screaming about cookies at the top of her lungs. I proceed to turn up the CD player as loud as I can. So now we are in the car with a screaming toddler and Scott's favorite blue's artist whaling on his guitar at a very high decibel. Scott is playing air guitar, I'm driving as quickly as I can to get home, Ava is red in the face from crying incessantly and Ella falls asleep in the middle of it all! I felt slightly guilty about turning the music up to tune Ava out, but you just cannot reason with her sometimes. She just throws these fits of whining and crying that make you feel like you'd rather be doing just about anything else in the world than sitting in the same room, much less the same car. I would have rather been collecting the trash in 15 degree weather, or chopping onions for eight hours straight. The title of this blog alone likely speaks volumes for our current stage of life experiences. I wish I had a note of optimism related to our experience to help encourage another mom, but alas, all I have is our shared experience. I did try to start my day on a positive note, before the chaos began and read a wonderful essay in a little book I picked up at Barnes & Noble called "Attitudes of Gratitude". The essay told the story of a man named Tom who eventually turned to a therapist requesting Prozac for his depression. The therapist instead asked if he'd be willing to try something everyday for a month. In the morning he was to ask himself "What do I feel grateful for about myself?" and in the evening he was to ask, "What did I do today that I feel good about?" 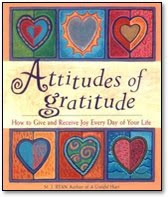 The author goes on to say that "Gratitude makes us feel good because it helps us widen our frame of vision. Under depression or stress we can develop tunnel vision, seeing only this problem and that difficulty...When we experience gratitude we give ourselves a dose of mental sunshine." So I did wake up this morning and before the chaos began I told Scott I was grateful that the girls had slept in (it was already twenty after 8!!!) and that we had a comfortable king bed to snuggle in with the girls on many mornings. I'm also grateful for the ability to have had two healthy children; I know this is a struggle for many people. So that is my mental sunshine for the day and I'm hoping it is enough to get me through.